An abandoned farmstead in eastern Montana stands as a symbol of land use change carried out by American and European settlers in the Great Plains. Photo credit: Terry Sohl, USGS. Sep 26, 2014 • [By Jon Campbell, USGS] Land change is a signature activity of human civilization. Since the dawn of history, people have purposefully converted natural landscapes to human-dominated areas. Typical motivations for land change are cultivation (e.g. slash-and-burn fields, rice paddies, modern farms); occupation (villages, cities, housing developments); and other cultural and economic pursuits (roads, schools, airports). Through time the surface of the earth has become a mosaic of natural and cultural landscapes. Each patch of the mosaic forms part of a diverse, yet interconnected set of landscapes ranging from relatively pristine natural ecosystems to completely human-dominated urban and industrial areas. 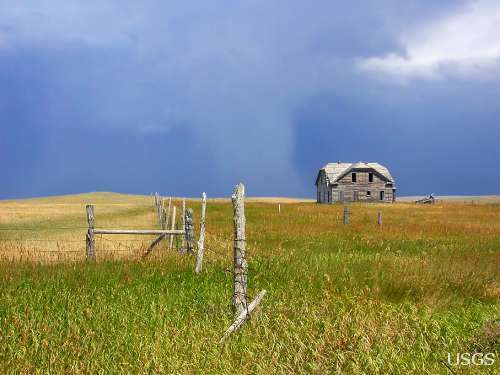 The scale of landscape change ranges from local (conversion of a farm into a suburb) to regional (conversion of tall grass prairie ecosystems to agriculture) to global changes (changing climate conditions, sea level rise). Land change and climate change have close connections. Climate change is widely recognized as having the potential to profoundly transform both ecological (natural) and cultural (human-influenced) landscapes. At the same time, land-use changes (e.g. deforestation, large-scale agriculture) not only have important impacts on climate and weather, but they also affect biodiversity (the breadth of plant and animal species), biogeochemical cycles (e.g. ocean acidification, hypoxia), and water resources through the alteration of greenhouse gas exchanges with the atmosphere, water vapor exchanges, water infiltration into the soil, water routing, and sediment flow. Urban development, forestry, agriculture, mining, and other land uses can substantially alter the Earth’s surface. Land use changes and the resultant change in land cover have important effects on ecological systems and processes. Projecting future land-cover change allows for the optimization and mitigation of potential consequences on numerous ecosystem processes such as biodiversity, water quality, and climate. Building on a long tradition of land cover investigations based principally on data acquired through the Landsat satellite program, USGS scientists now use land-cover modeling simulations to “temporally extend” — that is, backcast and forecast — traditional USGS land-cover databases into both the past and the future, beyond the dates where large-area satellite imagery is available. These alternative visions of the future provide researchers with the ability to examine uncertainties in future landscape conditions and to project the resultant impacts of the each of the four scenarios on ecological and social processes. FORE-SCE is also currently being used to produce “backcast” historical land-cover maps for the conterminous United States. Historical data sources such as population census data, historical agricultural census data, wetland change inventories, and forest databases are used to parameterize (set design limits on) FORE-SCE and produce annual land-cover maps going back to 1938. These data are spatially and thematically consistent with the future projected land-cover scenarios. The result is a seamless, consistent set of annual land-cover maps from 1938 through 2100, at 250-meter resolution and with 17 land-cover classes. Completion of backcast land-cover data for the conterminous United States will occur by early 2015. The backcast, the current, and the projected future land-cover data produced by USGS offer scientists in many fields the opportunity to study past effects of land-use change on the environment and to assess potential impacts for the future. This entry is filed under Agriculture, Carbon and Climate, Ecosystems and Biodiversity, News, Urban Growth.